In general my hair is quite dry and very wavy, so once a week I like to give it some TLC by using a hair mask of some sort. I have to admit that sometimes I do get a bit lazy and don't take care of my hair as much as I should so I have decided that at least once a week if not twice I am going to use a mask regardless of how busy I am or how lazy I'm feeling. Many brands have their own intensive treatments so it was hard for me to decide what to go for so I thought I would start with the Herbal Essences beautiful ends Split End Protective Intensive Mask - for Dry / Damaged hair. This mask retails from £4.07 for 200 ml from Boots but if you shop around you can usually get a good deal from your local supermarket. - Lavish the mask from root to tip. - Then rinse out and use once a week. 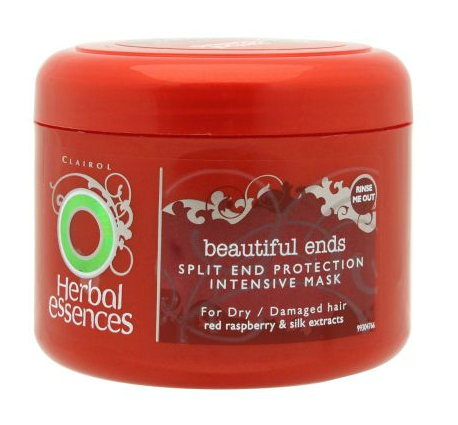 The beautiful ends Split End Protection Intensive Mask has a lovely fruity, summery scent with Red Raspberry and Silk Extract (not that I know what silk extract it supposed to smell like). Its of a thick consistency and it really leaves my hair smoother, silkier, and moisturised until the next time I wash it. It has made my hair more manageable and in general it has kept my hair in good shape. I find that I get around a months worth of usage I either leave it on for the 5 minutes recommended or leave it on over night and wrap my hair up in cling film for a really deep treatment. I definitely recommend this product for anyone that has similar hair type to me, its done wonders for me but I want to see if I can find something better (if there is) ! Does anyone have any suggestions ??? I think I'll have to try this! I have really bad split ends as I have a habit for constantly running my fingers through my hair! Great review, and beautiful blog! seems like a good product...nice review . joined your site,will be happy if u can join my blog too..
Have you got a blog post on your home made masks???? Would love any suggestions ??? Hey Anika is this product available in India?? I haven't seen it so far !